Brought to you by MOJO Outdoors, The all-in-one MAMA JAMA Duck Hunting Decoy is a highly effective, multi-purpose duck hunting tool. 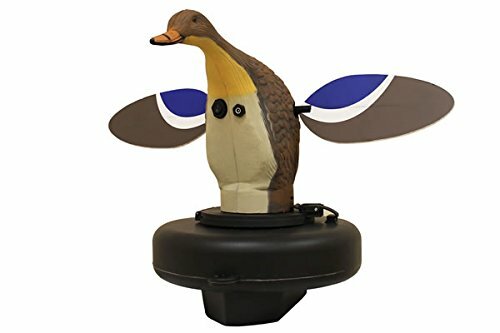 It combines the ability of a spinning wing decoy and the natural motion and sounds made by live ducks as they move on the water to attract ducks from long distances. All experienced duck hunters know that ducks see motion 2 to 3 times better than humans do and the MAMA JAMA decoy allows you to use that to your advantage by combining several of the desirable types of motion in one decoy. In addition to the spinning wings, it moves on the water producing ripples and moving water sounds. More importantly it produces the "V" like wake that ducks make on the water as they swim. This "V" like wake is one of the most visible ways flying ducks locate ducks on the water. An "on/off" control panel provides extreme realism. This decoy was specially designed by the MOJO Crew to be a "duck killing machine"! Includes a Mallard Hen Body (The Mama), specially designed floating base with propulsion pump to move the decoy in a natural way and a orifice discharge to make ripples and natural water sounds, all contained in a single realistic floating unit. Anchored by a 36"x 4 oz. MOJO Texas Rig. Complete with 12-volt rechargeable battery and charger that will run up to 8 hours on a fully charged battery.